GuardMaster® III Std. Wood Slat Swing Gate, Hrdw. Mounted "TOS"
Made in the USA. Perfect for both children and pets. Fits openings: 27”- 42”(W). 24”(H). Including uneven openings. Hardware kit included. TOP OF STAIRS. GuardMaster® III Tall/Extra Wide Swing Gate, Hrdw. Mounted "TOS"
Made in the USA. Perfect for both children and pets. Fits openings: 33”- 54”(W), 30”(H). Including uneven openings. Includes "Quick Remove" feature. Hardware kit included. TOP OF STAIRS. GuardMaster® III Tall/Super Wide Swing Gate, Hrdw. Mounted "TOS"
Hardware Kit for GuardMaster® III models 477, 480, 490 gates. 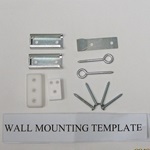 PLEASE NOTE: ALL GUARDMASTER® III GATES COME COMPLETE WITH ALL MOUNTING HARDWARE SHIPPING: All kits ship $2.00 per kit.